Chunk itZ are a visual spatial tool for building “number sense” for quantity to 10. As they BUILD with the Chunk itz students are BUILDING THE BASICS for knowing, recalling and REASONING about number properties and number facts to 10. They are using the brain’s ability to see and think in small units: subitizing. With the Chunk itZ, learners construct and confirm a relational understanding of number BEFORE they move to embedding them in ten frames. The first introduction is outlining and tracing with accuracy and perseverance. Small muscle development, hand eye co ordination and the ability to grip without strangling the pen and trace without bumps and slips are just a sample of the BASIC skills that impact BASIC FACTS. We cannot leave students to develop grip on their own. Help him. Identify, trace & trust 2s, 3s. This builds the foundation for thinking in collections. Without collections thinking students have nothing but counting by ones, a skill that will not build fluency with facts. What feedback can we give? Proportional reasoning and unitizing are also embedded in this practice. Coming to understand number engages all the senses. Link the symbols and practice printing. If we give students model numbers to study and copy we will see far fewer reversals. Interpreting, describing and “solving” puzzles builds thinking and reasoning skills. Students are challenged to manipulate the pieces in all directions as they fit them together. Gently but consistently, the teacher pushes students to see in their mind and describe without touching. Big ideas like unitizing and proportional reasoning are built into this approach. What pieces make my puzzle? Get tracing, talking and reasoning! We trace two twos and two threes. We trace three twos and three threes. Ideas about 4, 6 and 9 emerge but the focus is on developing the ability to move things in your mind. Equations will come but not right now. These puzzle pages and more are available in the Chunk itZ Book available in pdf. Order from me at glorway@thinking101.ca. Your cost is $39.95. This student made the puzzle from a distance then came up to check. He did not make the same puzzle. How many sides, how many vertices does each piece have? What shape does it create? This is an irregular hexagon. What is his understanding of 5? Figuring out what pieces fit where and how? The literature coming from a steadily developing body of very robust and reliable research focused on the difficulties that are blocking achievement Grades 7 and up makes clear that students do not understand number, number properties and number operations in a connected and meaning- filled way. Too many students believe math to be a set of disconnected answers rather than a way of thinking which can be mastered by anyone. Answers matter but understanding why that is the answer matters more. Work with the Chunk itZ places the focus on expressions to describe ways students see numbers. As students describe their puzzles, the teacher actively engages them in studying how to connect expressions. the focus is additive composition. What parts make this particular whole and how are they related. This focus on relationships lays a foundation for future grades that is absolutely critical. Teaching that attends to relationships puts a focus on seeing and explaining patterns which leads to the ability to generalize and apply procedures and formulas while it also develops and strengthens memory and recall skills. Students actively engage in their learning: discussing, debating, comparing. Engagement builds attention and attention leads to learning. And just as important, the relationships students are mastering will become the central focus in higher grades as they move into algebra and geometry. The link to equations is made with purpose and clarity. We are not “making” is statements. (Three and two makes five.) The equal sign does not mean “here comes the answer.” In the picture below the focus with the symbolic is not on getting the answer but rather it is on connecting expressions to demonstrate relationships between facts. Which “facts” are related. Where can you use brackets? Which expressions can you equate? Is this true: 5 + 2 + 2 = 5 + 4. Prove it. When students just want to write equations, teacher re direct their attention by challenging them to see equations as more than “answers” on the right. This student is excited to write 6 + 1 = 7, the teacher prompt is to push him or her to a richer understanding of the task by suggesting another expression. At present my attention with the Chunk itZ has been on developing a puzzling and problem solving focus with number to 10. 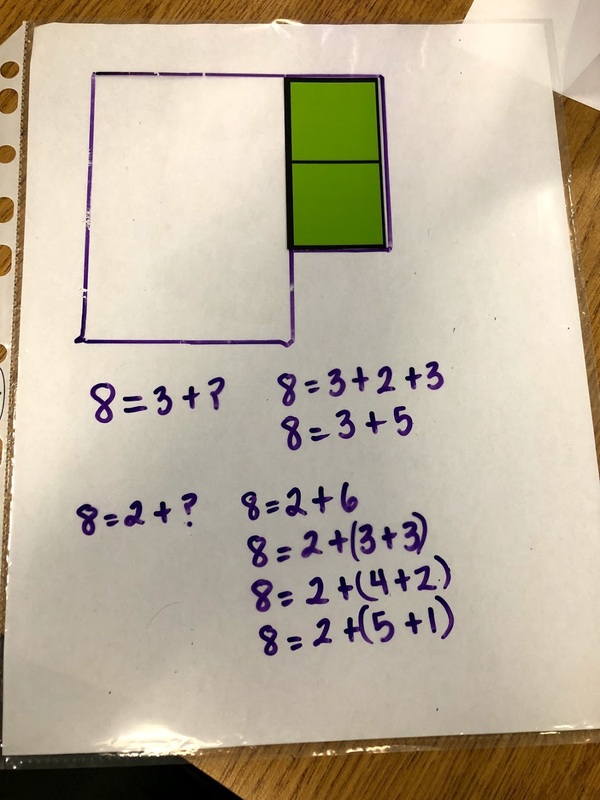 But as the work develops, students and teachers are seeing ways to connect to foundational understandings that prepare students for success with multiplication and division, perimeter & area, geometric space and properties, ratios and proportions. Chunk itZ are currently only available through this website.